The intent of our work is to transform and reveal aspects of the site's history, while modifying it in the present. The site was once a marsh. There was a river nearby. It was a seed farm. Later, it was a landfill. Now it is a sculpture park. By manipulating elements which reflect these functions, while addressing larger issues of human intervention in landscape, we create a poetic perspective to view the land. The work is sited in an existing path, connecting the central space of the park with the East River. 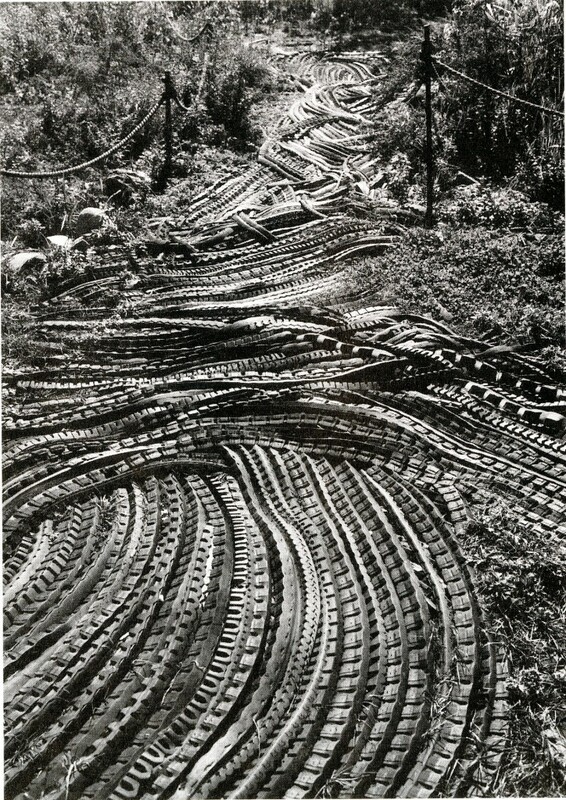 The tire treads, a symbol of the car culture, imply the decimation of the land and the landfill, while recalling the contradictory and organic relationship of rivers and roads. Also, the juxtaposition of the marsh grass, against the rubber river, suggests the regenerative quality of both can be transformed, shaped and renewed. Living in a time where many places appear used up, these transformative insights may lead us to a more productive future. Thanks to Mark Automation and Viking Fender.